I’ve got to recommend my Ed Week Teacher column and its accompanying BAM! Radio Shows. All of the many – and I mean many – student hand-outs in my new book on student motivation are now on the publisher’s site and can be downloaded for free — no registration is required. Just click on the “eResources” tab. And Routledge has been kind of enough to do the same for the zillion student hand-outs in my previous two student motivation books, too, though for those books they’re called “Supplemental Downloads.” Jossey-Bass has done the same with hand-outs from my last book on teaching English Language Learners (by the way, a sequel to that popular title will be published in 2016). How I Learned Differentiation appeared in Teach Thought, and is excellent. I’m adding it to The Best Resources On Differentiating Instruction. Adventures with gallery critique is by Andy Tharby. I’m adding it to The Best Posts On Writing Instruction. 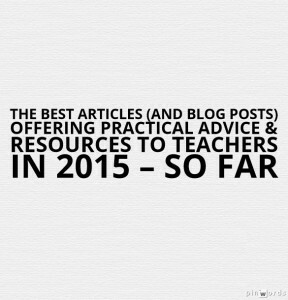 Last year I briefly referred to a study done in the United Kingdom evaluating what teaching strategies work best. A recent post by John Tomsett prompted me to revisit that meta-analysis from The Education Endowment Foundation, and it’s clearly worth exploring deeply (it’s official title is “The Teaching and Learning Toolkit). The report provides a John Hattie-like list of various interventions, along with their costs, the quality of evidence supporting each one, and the number of learning months research has showed it to gain for students. Though I say it’s Hattie-like, some of its findings seem to conflict with his. I’m very impressed with the UK analysis, and am planning on digging into it over the summer. A Teacher’s Role in Fighting Racism is from Education Week. Uncomfortable Conversations: Talking About Race In The Classroom is from NPR. History Lesson: Giving Students Freedom to Create Their Own Projects is by Brison Harvey at Ed Week. One point he makes that I think is particularly intriguing is letting his students develop individualized rubrics for their independent projects. Tips for Using iPads in the Classroom is from Edudemic. Why I Prefer Pre-Teaching to Remediation for Struggling Students is by Justin Minkel. Thanks to reader Vincy Murgillo for letting me know about the Smithsonian’s Tween Tribune. It provides daily news stories, with the same one edited several times for different reading levels. The stories also have self-scoring quizzes and provide decent “critical thinking” questions that students can respond to in the comments. On top of that, teachers can create virtual classrooms to monitor it all, as well as moderating student comments. And it’s all available for free! Help Students Close Read Iconic Images is an excellent post by Frank Baker in Middleweb. I’ve previously posted about Reading Teacher, a great site for beginning readers that’s been around for awhile, but just stopped charging for its use (see “Reading Teacher” Is A Good Site For Very Beginners). At that time, though it was free for individual use, you still had to pay if you wanted to create a virtual classroom. They recently announced that it’s now free to create a virtual classroom of 30 students to track their progress. The site says that if you have more students, you can just create another free account using a different email address to create a second virtual classroom. Top 20 Principles from Psychology for PreK–12 Teaching and Learning is a brand-new report from the American Psychological Association (APA). Though there’s nothing in it that regular readers of this blog wouldn’t already know, it nevertheless provides what might be the best readable compilation of important strategies around Social Emotional Learning Skills, assessment, and classroom management that can be found anywhere. Apps, Apps Everywhere: Are Any Good, You Think? is the title of my article in ASCD Educational Leadership. In it, I share my choices for the best eleven mobile-learning apps out there. Hands-Off Teaching Cultivates Metacognition is from Edutopia. I’m adding it to The Best Posts On Metacognition. Teaching MS History: Themes or Timelines? is from Middleweb. Every Teacher’s Guide to Assessment is from Edudemic. I’m adding it to A Collection Of “The Best” Lists On Assessment. 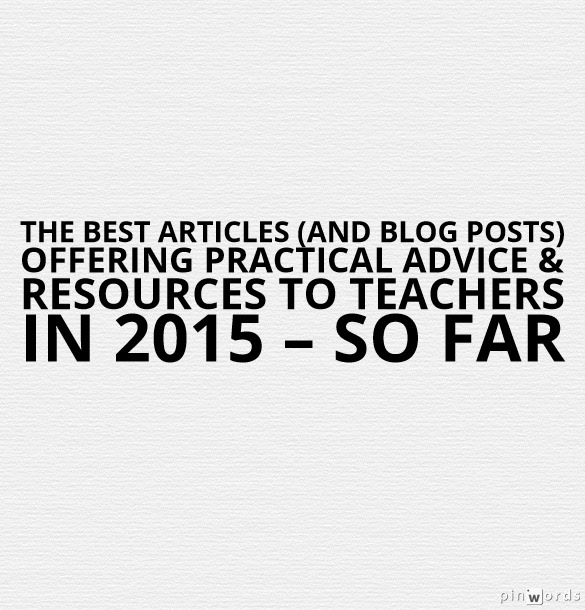 Here’s an exceptional older post by UK educator/blogger Alex Quigley. It’s titled Questioning – Top Ten Strategies and, as you’ll see, it has to be one of the best and most practical list of recommendations out there. I suspect that many educators, including me, are going to be referring to it often. 8 HABITS OF CURIOUS PEOPLE is from Fast Company, and could be a very accessible article for students to read. I’m adding it to The Best Posts On Curiosity. 3 Tips to Make Any Lesson More Culturally Responsive (and it’s not what you think!) is by Zaretta Hammond. I have previously posted about Richard Byrne’s fabulous search engine for video sites other than YouTube (see If You Don’t Have Teacher Access To YouTube At Your School, Then This Search Engine is a “Must”). He’s just updated it. Now, with the limitations YouTube’s Safety Mode is putting on teachers whose schools have been allowing YouTube, his search engine will be a “go-to” tool for many of us who haven’t needed it previously. You can read about the Safety Mode issue at my unfortunately very popular previous post, Our District Just Activated Awful YouTube Safety Mode – What’s Been Your Experience? Thinking Creatively About Homework is from John Spencer. I’m adding it to The Best Resources For Learning About Homework Issues. 3 Simple Ways to Differentiate Instruction in Any Class is by A. J. Juliani. I’m adding it to The Best Resources On Differentiating Instruction. American Educator, the quarterly magazine of the American Federation of Teachers, always has interesting and useful articles in it, and this Spring edition is no different. The most useful one to teachers, though, is clearly the one by Daniel Willingham. For The Love Of Reading: Engaging Students in a Lifelong Pursuit is a must-read article for every educator. It’s adapted from his new book, Raising Kids Who Read: What Parents and Teachers Can Do. I’m adding it to The Best Resources Documenting The Effectiveness of Free Voluntary Reading. Expeditionary Learning has created a number free, and good, curriculum units for English Language Arts, Science and Social Studies. You can download them here, and read more about them at Middleweb. (Not) Blooms. is from The Agility Teaching Toolkit(@ASTsupportaali), and offers a unique perspective on explaining Bloom’s Taxonomy to students. I’m adding it to The Best Resources For Helping Teachers Use Bloom’s Taxonomy In The Classroom. 10 Intriguing Photographs to Teach Close Reading and Visual Thinking Skills is an excellent post from The New York Times Learning Network. I’m adding it to the close reading list and also toThe Best Ways To Use Photos In Lessons. Should Teachers Be Allowed to Touch Students? is from The Atlantic. I’m adding it to The Best Posts About The Power Of Light Touches In The Classroom. 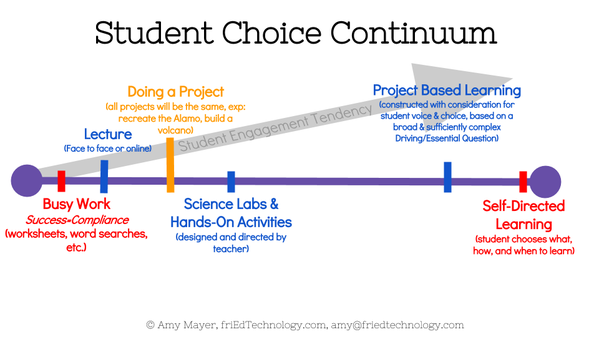 Amy Mayer has created what I think is an excellent visual about student choice, and has given me permission to publish it here. You can see/read more of her at work at the FriEdTechnology blog and follow her on Twitter at @friEdTechnology. I originally saw the visual on a tweet by Aaron Brengard.